Get Coffee Shop Coffee quality, Jo Coffee® certified organic wholesale coffee with our Wholesale Bundles of our Jo Six Pack cases and with free shipping. No account needed. We offer an eco-friendly Filter Cup Keurig® format in 12 cup cartons and in Jo Six Pack cases. Special order Fresh Seal Cup for office coffee and hotel in-room systems is available. We offer hand-crafted, artisan roasted USDA Certified Organic, Fair Trade Certified, NON-GMO gourmet specialty ground and whole bean coffee in 12 oz, 2 lb and Jo Six Pack cases. Highly rated certified organic whole bean, organic ground coffee, organic K Cup® coffee at wholesale prices for coffee shops, office coffee, bistros, cafes, restaurants or retail grocery with proven consumer satisfaction. 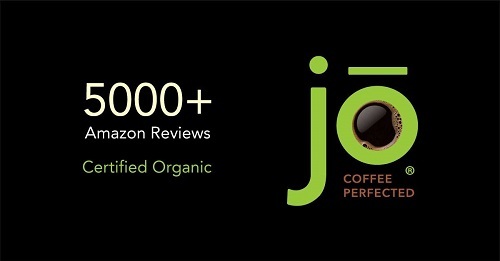 With over 5000+ positive reviews our Jo Coffee® brand is one of Amazon's highest rated certified organic coffee brands. Not all coffee is created equal. In today's world, consumers not only vote with their wallet but also with their online reviews. Consumers respond to high quality. Our Jo Coffee® is USDA and Kosher Certified Organic coffee. We offer single serve, 12 oz. and 2 lb. packages in whole bean or ground formats for immediate wholesale purchasing on this website. Contact us for ground portion/filter pack special order packaging. Our eco-friendly Filter Cup single serve for Keurig K-Cup® 1.0 and 2.0 brewers provides superior brewing extraction resulting in a better cup of Jo. These filter cups are also better for the environment with less packaging waste. We also produce a recyclable Fresh Seal Cup single serve cup for Keurig K-Cup® 1.0 and 2.0 brewers providing extended freshness and a great cup of Jo. This special order single serve packaging suitable for larger businesses fits all display racks required for office coffee and in-room coffee service programs. Contact us for special order wholesale pricing. Our SingleCup Jo for K-Cup® brewers were the first USDA Certified Organic produced in the Midwest. Our SingleCup Jo cups are compatible with Keurig K-Cup® brewers, including Keurig 2.0, and other single serve brewers. For food service businesses such as coffee shops, cafes, bakeries & restaurants that want a compelling, highly rated certified organic, and proven successful brand at wholesale prices, our Fair Trade Certified Organic coffee will impress your customers. Our popular 2 lb whole bean format or ground format perfect for restaurant drip brew systems, provides the highest quality at competitive wholesale coffee prices. Variable size net weights, ground portion packs, are available for special order custom wholesale accounts. Contact us for pricing. Our popular 2 lb ground or whole bean packaging is perfect for office coffee drip brew system, for office coffee buyers seeking highly rated organic coffee at wholesales prices for their employees. Variable size net weight ground portion packs are available for special order custom wholesale accounts. Contact us for pricing. We also produce single serve for Keurig K-Cup® brewers that fits In-Room Hotel and Office Coffee display racks. Our Fresh Seal Cup technology provides extended freshness for the best cup of Jo! Contact us for larger account pricing. Our Jo Coffee® brand is now currently in hundreds of independent grocery stores across the U.S. With our incredible success on Amazon, we choose not to offer our Jo Coffee® brand to Walmart (yes they asked; twice) or Target, thus giving independent retailers and grocers some exclusivity. For grocers, the Coffee® eye-catching package design provides certified organic coffee that customers love. Consumer response to this brand identity to buy, and our artisan quality to get them to buy again, is tremendous. Branded weekender floor displays for promotions and bulk coffee center display dispensers are available for qualified retailers. Free poster signage is also available. We will also offer in-store coffee demo's for larger, clustered corporate DSD account clients.